Old City Cemetery, established in 1829, is the oldest public graveyard in Tallahassee. Once scandalously overrun by hogs and cattle, it was acquired by the city in 1840. It was laid out in lots the following year when an epidemic of yellow fever swept the area, mandating sanitation regulations to protect the public. Originally burials were segregated, with the graves of whites restricted to the eastern section, while both slaves and free persons of color were interred in the western half. Today the cemetery is considered “one of Tallahassee’s most distinctive historic sites” (“Walking Tour” n.d.). The grave markers reflect the evolving attitudes about death in popular culture. While the earliest—wooden head- and footboards—have deteriorated, later marble tombstones of simple shape bear inscriptions expressing loss or hope. Later Victorian monuments reveal that era’s emphasis on classical art forms, as well as on death and mourning. Some of the “witch” claims are set forth in Haunted Places: The National Directory (Hauck 1996, 129), as well as some online sources. As we shall see, they are based on whimsy, superstition, ignorance, and misinformation. Let’s look at the main claims. However, unless we are to accuse everyone born in one of twelve months of witchcraft, perhaps we can move on. Ah! Broken is the golden bowl! Floats on the Stygian River. . . .
Hauck apparently fails to recognize the lines from Edgar Allan Poe’s Lenore. They were obviously chosen to urge proper funeral rituals for one who died at such an early age (twenty-three). According to some, “queenliest dead” suggests Queen of the Dead, which they interpret as meaning a witch (Mohan 2016). Actually, Poe’s poem goes on to say the deceased has passed “to a golden throne, beside the King of Heaven,” the very opposite of a witch! Finally, the very expense of the grave is cited as evidence. Bessie supposedly “bewitched a wealthy man into marrying her and wanted to commemorate her with the most elaborate stone in the cemetery” (“Weird U.S.” 2016). A newspaper obituary for Bessie Graham noted that, the mother of an infant, she was “the lovely young wife of Mr. John A. Graham,” who “loved and adored his wife with all the affection possessed by human nature.” She herself exhibited “rare personal beauty and excellent traits of character” (“Obituary” 1889). Her husband was a lumber magnate, a cattleman, and leading real estate developer of southern Florida. In 1894, he remarried and still later, despite his age, volunteered to serve in World War I, earning the rank of major (Moore 1922, 248, 387). Meanwhile he raised his and Bessie’s son, John A. Jr.
Other information about Bessie is scant, although her monument—properly read—tells more. As an obelisk, its form “was meant to represent rebirth and the spiritual connections between Heaven and Earth, life and afterlife” (Lorentz 2014). Near the top, the cross and crown not only express Christian belief, but the motif is also used in Freemasonry (and indeed, not surprisingly, her husband was a Mason). 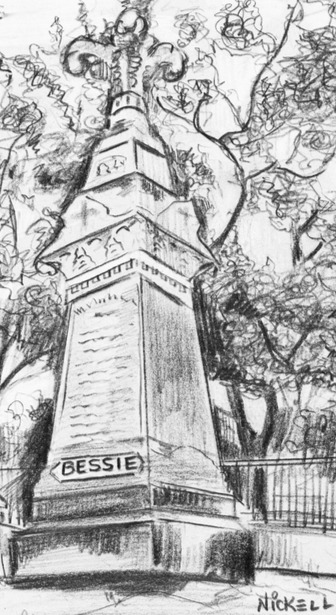 The verse’s invocation of the tolling (church) bell, “saintly soul,” and singing of “funeral song” all evoke traditional Christian worship, which, in Bessie’s time and place, were antithetical to witchcraft. Although graves traditionally faced east for the rising sun (a symbol of resurrection), the westward orientation would be consistent with Victorian emphasis on dying, sadly evoking the setting sun. Still, slanders and errors about Bessie continue. One source, a YouTube video, is so egregious I am embarrassed for its amateur raconteur (Mohan 2016). Without offering any evidence, he claims that Bessie was rumored to have been poisoned and suffered “a long, painful death” (although she actually died of heart trouble after a brief illness [“Obituary” 1889]). He says the ghost of a young woman is seen sobbing at the grave (but this too appears suspiciously to lack any source). He insists actual witches perform nighttime rituals at the grave during the full moon (but these are unknown to the cemetery’s management), and he states that anyone visiting the grave will have Bessie appear in his or her dream “that very night” (yet I can attest that that never happened to me). Everything we know of Bessie Graham speaks of the tragically brief life of a very good woman. Nothing whatsoever has come to light to warrant insinuations about her having been a witch—no document or even folklore from her time. There is nothing but nonsense, and most of that is apparent fakelore and social-media talklore. All of it is born of ignorance or mischief—leading to the careless defamation of her name, the wanton misappropriation of her legacy, and—in a very real sense—the shameful desecration of her grave. People have long left mementoes at gravesites for various purposes: small stones on a Jewish grave (supposedly originally to keep the soul down), flowers, coins, or other items by people of various beliefs to show remembrance, or a coin left in making a wish, etc. (“Adventures” 2013). Adventures in Cemetery Hopping. 2013. Available online at https://adventuresincemeteryhopping.wordpress.com/2013/12/13/weird-things-left-on-graves/; accessed May 13, 2016. Cross and Crown. 2006. Cemeteries and Cemetery Symbols. Available online at https://cemeteries.wordpress.com/2006/09/01cross-and-crown/; accessed May 10, 2016. Elizabeth Budd Wilson Graham. 2016. Available online at http://www.findagrave.com/cgi-bin/fg.cgi?page=gr&Grid=10150340; accessed May 12, 2016. Hauck, Dennis William. 1996. Haunted Places: The National Directory. New York: Penguin Books. Lorentz, Lisa. 2014. Grave Concerns. Available online at http://historicindianapolis.com/friday-favorites-grave-concerns/; accessed May 12, 2016. Mohan, Praveen. 2016. Haunted Grave of Bessie the Witch. Available online at https://www.youtube.com/watch?v=rmB13oj-A68; accessed May 20, 2016. Moore, David Decatur. 1922. Men of the South. New Orleans, LA: Southern Biographical Association. Obituary: A Sad Death. 1889. Given in “Elizabeth” 2016. Walking Tour of Old City Cemetery. N.D. Brochure of Historic Tallahassee Preservation Board and City of Tallahassee. Copy obtained October 17, 2011. Weird U.S. 2016. Available online at http://www.weirdus.com/states/florida/local_legends/tallahassee_witch_grave/; accessed May 5, 2016.